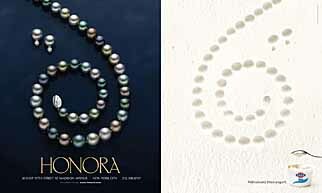 We enjoy this print effort between Greek yogurt brand Fage and jewelry label Honora, in which the latter's pearls are given extra dimension by the parallel illusion of a dip into the rich Greek yogurt. Fage may ring provincial, but its Ogilvy & Mather billing and collaborative dip-ins with brands like Honora suggest anything but. The coolest thing is that both products are cultured.